Ewe is one of the major languages of Ghana. The Associate Professor in the Department of Linguistics at the University of Ghana here provides a book about the language as such. He intends it as more than a textbook, and has written it at a level to be of use to both native speakers of Ewe andthose for whom it is not their mother tongue, providing relevantlinguistic insights. After an introduction to the relatives and dialects,phonology is covered: syllables, consonants, vowels, and tones. 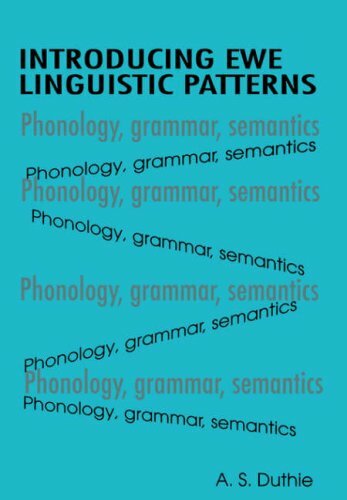 Grammar isalso covered, but the main part covers semantics. Exercises and answersfor practical application are given. If you have any questions about this product by A S Duthie, contact us by completing and submitting the form below. If you are looking for a specif part number, please include it with your message.